Applicants to be navigators on the federal health insurance exchange will be competing for just $10 million in funding this year, down from $36 million last year, according to the CMS' funding notice. Groups winning contracts will also be expected to promote not just qualified health plans but association and short-term plans as well. A minimum of $100,000 will be awarded in each of the 34 states that use HealthCare.gov to enroll people into coverage. Contracts will go to chambers of commerce, small businesses, trade associations and faith-based organizations to recruit navigators. Funding for navigators has fallen 84% since 2016 when funding was $62.5 million. "The Trump Administration's decision to cut funding that helps families navigate health insurance and select the best coverage for them is further evidence that the Trump Administration is putting politics above the needs of families," said Frederick Isasi, executive director of the left-leaning patient advocacy organization Families USA. The CMS will fund programs that have performed well, according to the agency. In a notice Tuesday, agency officials expressed disappointment about previous sign-up rates. 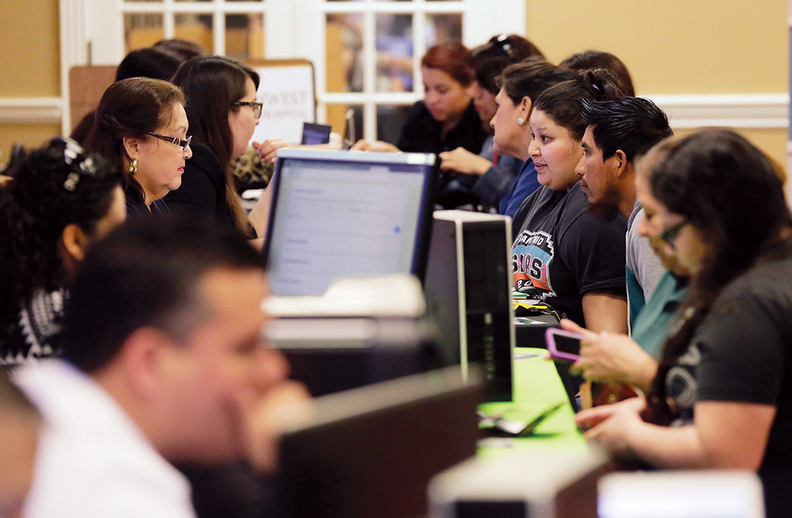 During last year's open enrollment, navigators received $36 million in federal grants, but enrolled less than 1% of the entire exchange enrollment population. In contrast, agents and brokers helped enroll 42% of those who sought coverage on the federal exchange. Applicants this year must show they have innovative ways to increase enrollment. They'll also be expected to outline their strategy on raising awareness of not only qualified health plans, but association health plans and short-term, limited-duration coverage as well. The Trump administration last month finalized a rule to expand access to association health plans. It will likely encourage healthy people to seek the cheaper, less robust coverage options and lead millions of others to forgo coverage all together, according to officials at the U.S. Labor Department. The CMS states that navigators will get "points" if they promote association and short-term plans as a way of making consumers aware of the "full range of the different types of coverage options available to them." That is targeted specifically at people deemed "left behind," meaning individuals who are disproportionately without access to health insurance coverage or care. "It's time for the navigator program to evolve, which is why we are announcing a new direction for the program today," CMS Administrator Seema Verma said in a statement. Earlier this year, the CMS finalized a policy that removed the Obama-era requirement that each exchange must have at least two navigator entities with a physical presence in whatever area they are servicing. Removing these requirements will help navigators to lower operating costs and focus on enrolling consumers as well as enable grantees to engage in digital and online outreach to reach a broader audience, according to the CMS. Applications for navigator funding are due Aug. 9 and awards are expected to be announced Sept. 12. The six-week open0enrollment period for HealthCare.gov begins Nov. 1.